A chic and stylish alternative to the little black dress, the Drewe Jumpsuit will be your new favourite go-to! 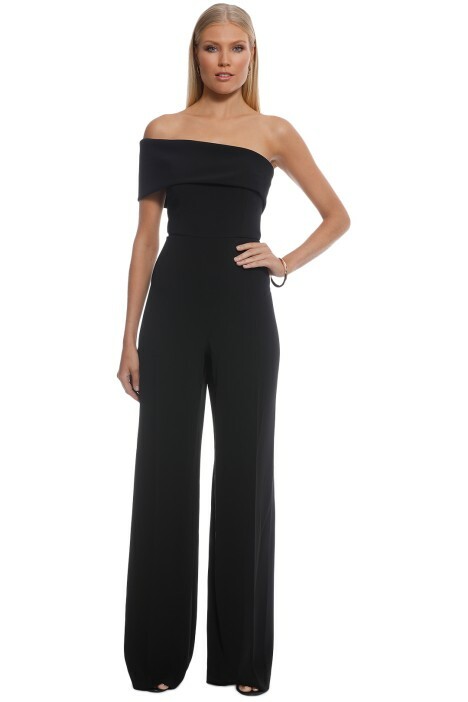 The stunning black jumpsuit features an off-shoulder neckline with a fitted bodice flowing down to universally flattering wide-legged trousers. Hire it for your next cocktail party or evening event. Complete your effortlessly chic look with tousled beach waves, statement earrings and an oversized clutch available for rent. Head over to our blog for some ideas on what shoes to wear with jumpsuits. Jay Godfrey’s namesake label is both minimal and sophisticated. Based in New York, his stunning tailored silhouettes are inspired by the chic New York woman. Achieving the perfect balance between classic and contemporary, Godfrey’s dresses have a wide celebrity following including Jennifer Lopez, Eva Mendes and Leighton Meester. Please note that Jay Godfrey is an American brand. Drewe Jumpsuit is rated 4.5 out of 5 by 2. Rated 4 out of 5 by Kate from Love the look I rented this for a formal wedding but didn’t end up wearing it (wore my back up dress instead). I loved the style but unfortunately it was too long for me, even in heels.